At four years of age, Chester is lucky. He has far exceeded the lifespan of pigs on farms - six months is the traditional age of slaughter. He will most likely live another 4-6 years. We hope longer, he is a true gem among pigs! At veterinary schools across the country, there is a little known partnership between teaching hospitals and farmers. When animals being raised for food become ill with treatable conditions, some farmers send those animals to the teaching hospital for free veterinary service. When the animal is healthy, the school returns him to the farmer for slaughter. Such was the case with Chester and seven other piglets. All eight piglets had easily treatable problems, like abscesses or hernias. However, these conditions meant the pigs could not be sent to slaughter for human consumption. They were sent to a veterinary teaching hospital, at the young age of 3-months, where they were individually cared for by veterinary students. 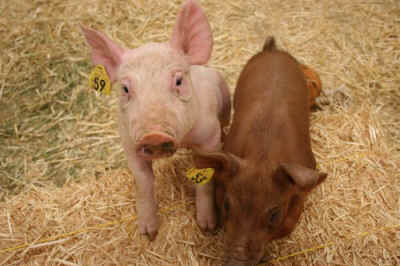 Piglets are incredibly social, intelligent, engaging animals. These eight piglets were no exception! But Chester stood out. He was more mischievous, a little bit of a rascal. His vet student fell in love with his personality and small, sturdy frame. After she fixed his hernia, the vet students was faced with the stark reality - Chester wasn't "hers" and he would be going back to the farm for slaughter. Instead of giving up and sending Chester to certain death, she contacted Animal Place and implored us to help. We met Chester and the other pigs and then began the arduous journey of getting them released into our custody. The vet school was resistant - they did not want to start a precedence of vet students thinking they could save the animals they...saved. The farmer was less resistant and was fine with releasing the pigs to us. 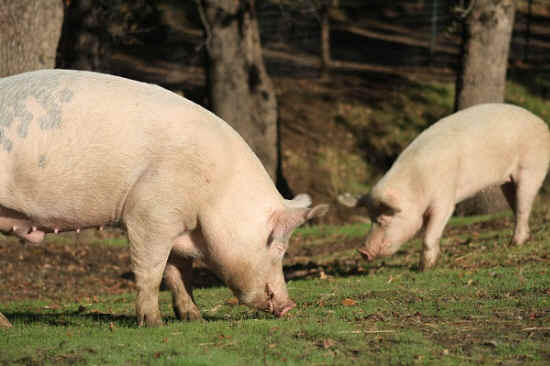 In the end, Chester and Claire came to Animal Place while the remaining piglets went out to live their lives at other sanctuaries. Chester started out as a troublemaker. We were certain he would be a "problem child" as he got older. Claire, on the other hand, showed us her gentle demeanor and we thought she would turn out sweet and kind as an adult. At the age of four, Chester is an incredibly sensitive, sweet pig. He does not have a mean bone in his body. 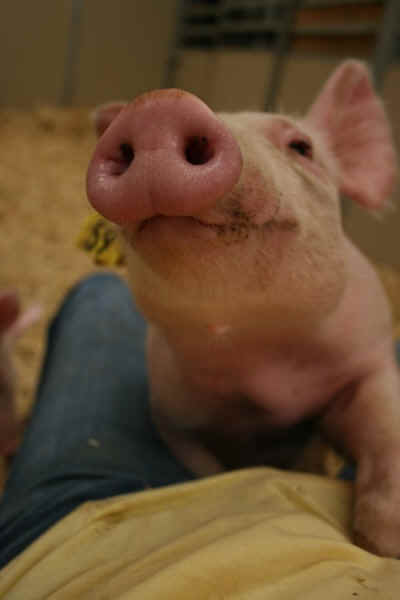 He loves receiving visitors for belly rubs and is wonderful around the other pigs. Claire, on the other hand, may be the prettiest pig around, but she is prone to nipping and grumpy outbursts. Chester is lucky. He has far exceeded the lifespan of pigs on farms - six months is the traditional age of slaughter. He will most likely live another 4-6 years. We hope longer, he is a true gem among pigs!